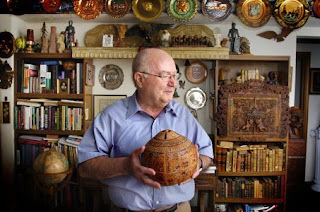 Bruno Frigoli holds his life in his hands, in the form of a gourd carved by a Peruvian artist. The delightfully detailed pictures depict his evolution from ex-Italian fascist to Latin American evangelist. "He went to look for gold in Bolivia," says one panel showing him fording a mountain stream. The next frame shows him kneeling before a preacher and praying, "Savior Jesus, forgive me and make me your servant." "Look at that," Frigoli says with a chuckle. "That's me." So is the man depicted in the frame below, preaching salvation with a microphone. That's what Frigoli did for more than 50 years, traveling the highlands of Peru, Bolivia and Argentina with his wife from West Michigan, starting churches, caring for orphans and teaching the gospel. many things about Bruno Frigoli's life seem unlikely. Going from enthusiastic Italian fascist to a leading evangelist for the Assemblies of God is not your usual career path. For Frigoli, the fact his life was spared while so many of his fellow officers were executed -- including his father -- is evidence of the God he serves. He had come to Argentina to start life anew after the war. When prospecting for gold turned up nothing, he managed a sawmill for his first wife's family. That might have been it had he not heard a Swedish Salvation Army captain preach on Good Friday, 1954. It was in a little church in Santa Cruz, Bolivia, with an apple cart for an altar. The preacher told the story of the Prodigal Son. Frigoli's brother-in-law, Leonardo, turned to him and said, "That's for you, Bruno."